Come and post here with anything Parvum be it your build photos, a link to your build log or to just to share with everyone your every thoughts we welcome anything Parvum related. If you have any questions that aren't answered here, or you need something more specific, please feel free to contact our two lovely Hardware Reps @imersa and @Mads1 who will be more than happy to help you. Based in the UK, Parvum Systems specialises in producing custom acrylic computer cases with a unique and elegant design across their entire range. Beyond what they offer at a retail level Parvum Systems is also open to custom requests to give you the personal, hands on control over your future case allowing you to create that one of a kind look. In addition to their ever growing line of cases Parvum also have their own line of 120mm high pressure case fans which offer excellent performance for both air and water cooled systems. "Here at Parvum Systems we pride ourselves on making each case with that little extra bit of care and offering a slightly more personal approach to the world of computer cases. " If you write or find any other reviews of our products please message me and I will add them to the list. Our current retail line consists of the following six cases however each is able to be customised or changed to your liking. - Drive Mounts: (4x) 2.5"
- Drive Mounts: (2x) 2.5" or (2x) 3.5"
- Drive Mounts: (2x) 3.5" and (2x) 2.5"
- Drive Mounts: (2x) 2.5" and (2x) 3.5" or (4x) 2.5"
Parvum Systems cases are available for order from Performance PC's (US), Overclockers (UK), HighFlow (NL), caseking (DE), and from Parvum Systems directly. Working closely with Premier cooling brand Alpenföhn Parvum is proud to have produced the Parvum F1.0 a high performance modified Wings Boost 2 fan which is now available in both black and white colour schemes using the Wings Boost technology to reduce air turbulence within your system. Find out more by clicking on the picture below. 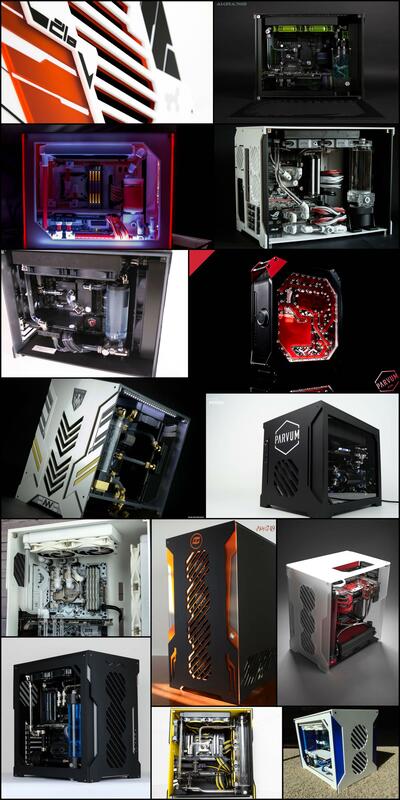 Here is a sample of some of the absolutely amazing builds from the members of OCN you can find a full list of Build Logs below please do check them out as all of these guys have put lots of effort into creating these jaw dropping builds. There are many many more that aren't featured in this photo but if I was to include every single photo this thread would be never ending! Here's an index of Parvum Systems build logs here on OCN. If you start or spot a new build log on OCN that you don't find here please do let me know and I'll add it if I haven't already. You don't have to be doing this as a job or have professional equipment to be added to the list as long as the case if Parvum you're in! All the documentation that you could want for any of the cases can be found here including assembly instructions and videos as well as guides on pump placement and what kind of GPU you can expect to fit within your new Parvum Systems Case. Many people are asking what kind of video card can fit in a Parvum Systems S2.0. This is a really hard question to answer since it depends on many factors like the video card itself, the GPU water block, the front radiator, the fans and the pump/res location. First of all, I need to talk about my configuration in order to understand the measures. I used a push configuration with 2x 25mm fans and a 30mm radiator. I also used a D5 pump with a mod top and a mod kit. You might not have the same constraint if you use a DDC pump. With a little close-up, we can see that I have a 9mm clearance between the pump's top mod kit and the radiator. Unfortunately, it doesn't really matter since the pump's mod kit is at the back and only has a ~2mm clearance with the radiator (where the fins are). This close-up gives you a good idea of the clearance between the pump's top kit and the GPU (5mm). This clearance is even reduced when you look at the back for the pump's mod kit (~1mm). If you want to stay out of trouble, use the reference model (at least for the GeForce 700 series) and you'll be fine. The dimension of my video card (EVGA 780TI Superclocked w/ ACX Cooler (03G-P4-2884-KR)) are (Long, Height, Wide) 266.7mm x 38mm x 111.5mm / 10.5" x 1.5" x 4.4". These are the dimensions without the water block and the backplate. As previously mentioned, the case is 400mm long. You then have 345mm if you remove 25mm for the fans and 30mm for the radiator. My pump's top mod kit is 65mm and my video card is 266mm which leaves me a maximum clearance of 14mm (400-25-30-266-65). My problem was with the pump's mod kit (at the back) which is 75mm so in fact I only have a clearance of ~3-4mm (400-25-30-266-75). In other words, your formula should be: 400mm - #fan# - #front radiator# - #graphic card# - #pump#. This number must be greater than 0 otherwise it won't fit. That being said, Krulani and Dr m4rc3l have been able to resolve the issue by either removing the acrylic window or by ordering a new custom window. Parvum Systems is an amazing company and one of the best custom service I have ever seen. Do not hesitate to contact @imersa if you need a custom order, he will help you if you have any issues. Different configuration are possible. The most common, as of today, is to place the pump/res combo between the GPU and the front radiator/fans. If you wish to include this Owners Club in your signature just copy the code below and paste it into your signature editor. As a closing note I want to say a big thank you from all of us at Parvum Systems for being part of this ever growing community and we look forward to seeing your amazing builds as they come, so get building! be an awesome thread, I'm sure of that. I shall start the owners submissions with my build. I'd also like to mention to anyone looking into a Parvum case that you will not find a more fun case to work with. It's hands down the best case I've worked with thus far, period. I'll sub to this also! Love these cases, and especially that Parvum are UK based. Hopefully you have an ATX case out for when I do my next build, I'll definitely indulge in one. So many illiterates. So little time to correct. "We were born with nothing and we sure as hell have nothing now"
I think to make it official you need a members list and have 10 sign-ups. Other member clubs use google docs to make the sign-up list submission form and members list. I'm not sure exactly how that works, though sorry. As for my own membership: I'm working on too many cases of my own, but I was curious about Parvum cases. So I recently acquired the purple and black prototype from K.3nny (see K.3nny's Aurora Parvum build log). I had also previously bid on L3P's green and black one.